Engineers at the University of California, San Diego have invented a “nanosponge” capable of safely removing a broad class of dangerous toxins from the bloodstream – including toxins produced by MRSA, E. coli, poisonous snakes and bees. These nanosponges, which thus far have been studied in mice, can neutralize “pore-forming toxins,” which destroy cells by poking holes in their cell membranes. Unlike other anti-toxin platforms that need to be custom synthesized for individual toxin type, the nanosponges can absorb different pore-forming toxins regardless of their molecular structures. In a study against alpha-haemolysin toxin from MRSA, pre-innoculation with nanosponges enabled 89 percent of mice to survive lethal doses. Administering nanosponges after the lethal dose led to 44 percent survival. The team, led by nanoengineers at the UC San Diego Jacobs School of Engineering, published the findings in Nature Nanotechnology April 14. “This is a new way to remove toxins from the bloodstream,” said Liangfang Zhang, a nanoengineering professor at the UC San Diego Jacobs School of Engineering and the senior author on the study. “Instead of creating specific treatments for individual toxins, we are developing a platform that can neutralize toxins caused by a wide range of pathogens, including MRSA and other antibiotic resistant bacteria,” said Zhang. The work could also lead to non-species-specific therapies for venomous snake bites and bee stings, which would make it more likely that health care providers or at-risk individuals will have life-saving treatments available when they need them most. The researchers are aiming to translate this work into approved therapies. “One of the first applications we are aiming for would be an anti-virulence treatment for MRSA. That’s why we studied one of the most virulent toxins from MRSA in our experiments,” said “Jack” Che-Ming Hu, the first author on the paper. Hu, now a post-doctoral researcher in Zhang’s lab, earned his Ph.D. in bioengineering from UC San Diego in 2011. Aspects of this work will be presented April 18 at Research Expo, the annual graduate student research and networking event of the UC San Diego Jacobs School of Engineering. In order to evade the immune system and remain in circulation in the bloodstream, the nanosponges are wrapped in red blood cell membranes. This red blood cell cloaking technology was developed in Liangfang Zhang’s lab at UC San Diego. The researchers previously demonstrated that nanoparticles disguised as red blood cells could be used to deliver cancer-fighting drugs directly to a tumor. Zhang also has a faculty appointment at the UC San Diego Moores Cancer Center. Red blood cells are one of the primary targets of pore-forming toxins. When a group of toxins all puncture the same cell, forming a pore, uncontrolled ions rush in and the cell dies. The nanosponges look like red blood cells, and therefore serve as red blood cell decoys that collect the toxins. 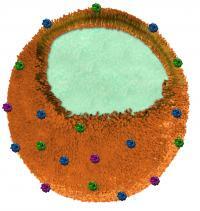 The nanosponges absorb damaging toxins and divert them away from their cellular targets. The nanosponges had a half-life of 40 hours in the researchers’ experiments in mice. Eventually the liver safely metabolized both the nanosponges and the sequestered toxins, with the liver incurring no discernible damage. Each nanosponge has a diameter of approximately 85 nanometers and is made of a biocompatible polymer core wrapped in segments of red blood cells membranes. Zhang’s team separates the red blood cells from a small sample of blood using a centrifuge and then puts the cells into a solution that causes them to swell and burst, releasing hemoglobin and leaving RBC skins behind. The skins are then mixed with the ball-shaped nanoparticles until they are coated with a red blood cell membrane. Just one red blood cell membrane can make thousands of nanosponges, which are 3,000 times smaller than a red blood cell. With a single dose, this army of nanosponges floods the blood stream, outnumbering red blood cells and intercepting toxins.